Remington Golden Saber self-defense ammunition is a solid standard in the defensive handgun world due to the round’s reliable expansion, terminal velocity, and genius design characteristics. 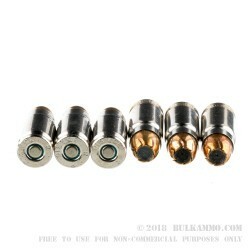 The Golden Saber bullets have also become a popular mainstay in the law enforcement world due to their consistency, reliable feeding, and ability to retain almost all of the bullet weight upon impact. Their manufacturing process employs the Remington “Bonded” design, which keeps the high quality, refined, lead core locked in tight to the thick copper jacket. Together, they create the famous Golden Saber Hollow Point round we all know and respect. These rounds feature 125 grain Jacketed Hollow Point bullets that are loaded into a non-corrosive, high-polished, reloadable, Boxer primed brass cases. They have a muzzle velocity of 1220-feet per second and a muzzle energy of 413-foot pounds of 357 Sig fury. 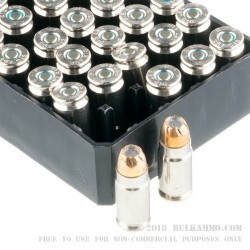 Get yourself a 500 round case or two now, and make your next day at the range, a great one. 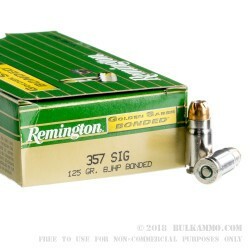 The 357 Sig is another cartridge that is a heavy hitter in the handgun world. It was and still is a game changer due to its accuracy, reliable penetration, and effect on target. Designed in 1994 with Federal Cartridges and Sig Sauer, the 357 Sig round is still out there in multiple handguns all across the USA.